Pete's Blog & Grille: Where you Winsome and lose some. But mostly win. Where you Winsome and lose some. But mostly win. See that smiling lady in the photo? She's Winsome. Google tells us winsome means "attractive or appealing in appearance or character." And Google uses, as an example, "a winsome smile." I took the picture about two hours ago. But it was more like 10 years ago that I first spoke to Winsome and told her she had the perfect name. That was also the first time I went through the take-out lane at the McDonald's where Winsome works. And that visit didn't come long after I started working in this office where I am today; where I'm spending this final day, in fact. Come Monday, I'll be working from home full time. Over the years I likely visited Winsome's McD's a few times a month. But I should add this: I've heard that when a doctor asks a Canadian guy how much he drinks, the doctor usually listens to the answer and then doubles it to get a nearer-to-the-truth amount. It's probably the same when you ask a guy how often he eats at a McDonald's. There always seemed to be somebody behind me in line and McD's staffers don't get a lot of free time. Indeed, it's maddening that the rest of the world fails to run on my schedule. But I'm pretty sure Winsome doesn't know my name and that I think about her more than she does me. But something very nice happened between me and Winsome today. I got to the order window and told the order taker I'd like a Greek salad. Tugo. McDonald's salads are quite tasty and I'll never forget the first time I had one. Yes, it was at Winsome's; in fact, the day I ordered it, I pulled up to the takeout window, you know who opened it, handed me the bag but said "Hey! Look at you! Having a healthy salad! Good for you!" Yup. 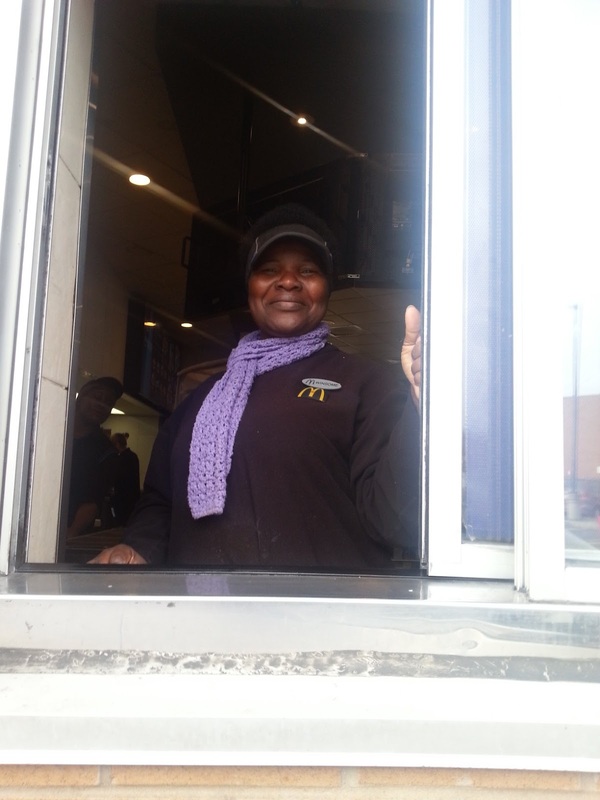 I'd be lying if Winsome's heartfelt cheer of enthusiasm didn't affect my McDonald's buying habits from then on. I've eaten healthier since. And newsflash: McDonald's salads are just as palate-friendly as anything else they make. You never can tell, can you? So, after all those years, today finally arrived. I took my final trip to the drive-thru. I ordered a Greek salad, paid at the cash booth, then drove slowly up to the pickup window. The sliding glass door opened, and yeessss! Winsome!! She greeted me like a long-lost cousin, albeit one that I was meeting in jail. We were separated by glass, after all. I asked if I could take her picture. She asked why. I said I was moving on; that this might be the last time I visit her and I'd like to write about it. She probably thought I was nuts but she said okay, then stood back and grinned a smile that I can state categorically was good for my health. That is what I call winsome.